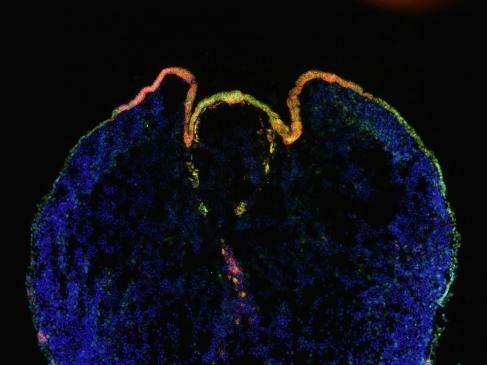 Elena Cattaneo reports on recent research that examines how a particular type of cell develops in the human brain, and how studies like this fit into the overall picture of research collaboration and funding, in Italy and in Europe. It took 4 years of continuous experiments of 17 researchers from 6 groups in 2 European countries to understand more about how cells develop in the striatum. The striatum is the area of the brain that degenerates in Huntington’s disease (HD) – a neurological disorder that as of today, has no cure. This work, led by my group at the University of Milan, was published in Nature Neuroscience on 10 Nov 2014. This kind of study is important because we need to understand more about how our tissues and our cells develop in order to understand why they degenerate. This will also allow us to build strategies to slow the advancement or prevent the onset of disease. We identified how striatal neurons mature in the human brain, at a molecular and functional level. These neurons are the ones that die in Huntington’s disease. During the earlier stages of the development of the brain, stem cells are found in an area just around the ventricles (shown below). 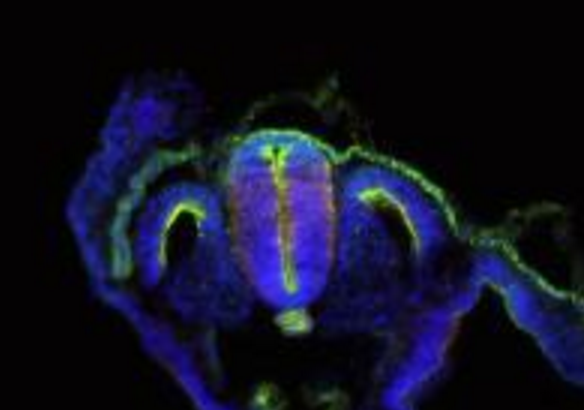 Stem cells destined to generate the striatal neurons possess an identifying molecular code, which then turns into a second code acquired by the cells when they move from this location en route to the striatum. 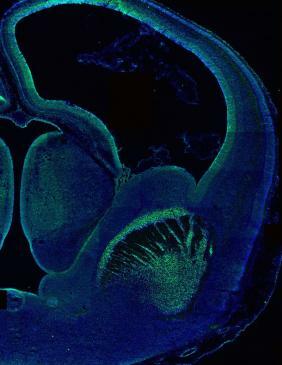 Then, a third identifying code is acquired when the cells finally reach the striatum, where they will remain. For the first time, we could study these 3 steps in development, working with post mortem tissue. This is made available for academic research through projects that have been assessed and meet strict ethical criteria set by the competent national bodies. This study kicked off with a small grant awarded by the Italian Minister for Education, University and Research (MIUR) which allowed us to obtain preliminary data. Then, we could start working at a European level to bring together many other colleagues. Internationally, competition is extremely high. One cannot show up without credibility and preliminary data, and the production of this requires national funding and many years in the lab. We - at the University of Milan – have been coordinating two EU grants on stem cells for neural cell replacement, Neurostemcell (2008-2013) and then Neurostemcellrepair (2013-2017). Both focus on Parkinson’s (PD) and Huntington’s diseases. In these projects, we were excited to follow the work of colleagues and partners who have been working on PD and have been recently able to obtain dopaminergic neurons – those that die in PD – which are authentic and fully functional, starting from stem cells (Cell Stem Cell. 2014 Nov 6). Our colleagues in Sweden have been striving for years to get to that result and that required both national and international commitment too. Our study looks at another type of neuron, the medium spiny ones that degenerate in HD. We have carefully observed their genesis, their progression and maturation. Now, like our colleagues working on PD, we wish to apply what we’ve learned to stem cells, to obtain authentic striatal neurons that look and work as similarly as possible to those already in our brain. One should never give up on acquiring new knowledge. In our lab we carry on 20 different and parallel projects on HD, using every possible and rational strategy that has been positively assessed. Stem cells are one path and just like many other laboratories we follow more paths at the same time. We just cannot rely on one only. My main concern lies in the fact that our country seemingly forgot its duty of pursue and invest in knowledge and all its different shapes. If we think about research funding, there is not a single call left for basic research. That’s tragic. Basic research is essential to move the first steps in many new directions that research may take and that tomorrow may allow us to compete internationally and worldwide. These are even more essential to younger scientists, who need to build their scientific credibility in order to participate as partners in larger European projects. Without national funds dedicated to basic research we have no opportunity to be competitive among the world elites of knowledge-building and we face severe obstacles in getting European funding. Images courtesy of Marco Onorati and Valentina Castiglioni (University of Milan). This work received funding from the EU projects Neurostemcell and Neurostemcellrepair. The views, opinions and positions expressed are those of the writer, and may not necessarily represent those of EuroStemCell or other site contributors.